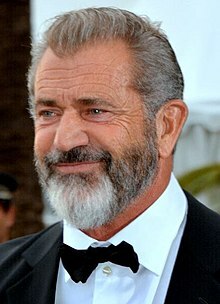 Mel Colm-Cille Gerard Gibson, AO (born January 3, 1956) is an Australian and American actor and movie maker. He is mostly known for his roles in action movies. Some of his most famous roles are in Mad Max (1979), Gallipoli (1981), The Bounty (1984), Lethal Weapon (1987), and Braveheart (1995). He directed The Passion of the Christ in 2004. He loosely based it on the visions of St. Catherine Emmerich. Gibson was born in Peekskill, New York, United States. His father, Hutton Gibson, was a veteran soldier during World War II and was also a famous writer. His family moved to Australia in 1968, when he was 12. He studied acting at the National Institute of Dramatic Art in Sydney. He also has Irish citizenship. ↑ Sacks, Ethan (24 December 2011). "Mel Gibson officiallly divorces wife of 31 years". New York: NY Daily News. Retrieved 8 April 2012. ↑ 2.0 2.1 "Mel Gibson and his girlfriend welcome a baby girl". Retrieved 2009-10-02. ↑ Mark Morris (16 July 2000). "Mel Gibson: Proud or prejudiced?". The Observer. Guardian News and Media Limited. ↑ John Hiscock (21 January 2010). "Mel Gibson interview". The Telegraph. Telegraph Media Group Limited. ↑ Matt Probert; Leela Probert. "Mel Gibson". The Probert Encyclopaedia. The New Society For The Diffusion of Knowledge. Retrieved 12 March 2014. ↑ "Mel Gibson". WordNet. Princeton University. Retrieved 12 March 2014. ↑ "Mel Gibson net worth". Celebrity Net Worth. Retrieved 12 March 2014. ↑ "Mel Gibson". eNews Reference. Retrieved 12 March 2014. ↑ Clarkson, Wensley (1993). Mel Gibson: Living Dangerously. New York: Thunder's Mouth Press. p. 30. ↑ Stephen M. Silverman. "Jonathan Rhys Meyers Crowned Best Actor in Ireland". People Magazine. Retrieved 2 March 2008. ↑ "AACTA - Past Winners - 1979". AACTA.org. Retrieved 9 November 2011. ↑ "AACTA - Past Winners - 1981". AACTA.org. Retrieved 9 November 2011. ↑ "People's Choice Awards Nominees & Winners: 1991". PeoplesChoice.com. Retrieved 18 July 2010. ↑ "People's Choice Awards Nominees & Winners: 1997". PeoplesChoice.com. Retrieved 18 July 2010. ↑ 15.0 15.1 "People's Choice Awards Nominees & Winners: 2001". PeoplesChoice.com. Retrieved 18 July 2010. ↑ "People's Choice Awards Nominees & Winners: 2003". PeoplesChoice.com. Retrieved 18 July 2010. ↑ "People's Choice Awards Nominees & Winners: 2004". PeoplesChoice.com. Retrieved 18 July 2010. ↑ "Star-gazing". The Milwaukee Journal. 13 March 1993. Retrieved 18 July 2010. ↑ DeArmond, Michelle (8 March 1996). "Travolta, Bullock honored". Las Vegas Sun. Retrieved 18 July 2010. ↑ BWW News Desk (25 March 2010). "Jennifer Garner and Sarah Silverman Added to All-Star Lineup Honoring Matt Damon". Broadway World. Retrieved 18 July 2010. ↑ Sams, Christine (9 December 2002). "Gulpilil leads lesser lights to glory". The Sun-Herald. Retrieved 18 July 2010. ↑ "Jesus helps Mel hit No. 1". CNNMoney.com. 18 June 2004. Retrieved 18 July 2010. ↑ "Awestruck by 'Lethal Weapon'". Malaysia Star. 23 September 2007. Retrieved 18 July 2010. ↑ "Mel Gibson to be honoured at IFTA ceremony". Rte.ie. 8 February 2008. Retrieved 22 October 2008. This page was last changed on 22 February 2019, at 14:08.